A transatlantic flight is the flight of an aircraft across the Atlantic Ocean from Europe, Africa, or the Middle East to North America, Central America, or South America, or vice versa. Such flights have been made by fixed-wing aircraft, airships, balloons, and other aircraft. Early aircraft engines did not have the reliability needed for the crossing, nor the power to lift the required fuel. There are difficulties navigating over featureless expanses of water for thousands of miles, and the weather, especially in the North Atlantic, is unpredictable. Since the middle of the 20th century, however, transatlantic flight has become routine, for commercial, military, diplomatic, and other purposes. Experimental flights (in balloons, small aircraft, etc.) present challenges for transatlantic fliers. Alcock and Brown made the first non-stop transatlantic flight in June 1919. They took off from St. John's, Newfoundland. The competition was suspended with the outbreak of war in 1914 but reopened after Armistice was declared in 1918. Between 8 and 31 May 1919, the Curtiss seaplane NC-4 made a crossing of the Atlantic flying from the U.S. to Newfoundland, then to the Azores, and on to mainland Portugal and finally the UK. The whole journey took 23 days, with six stops along the way. A trail of 53 "station ships" across the Atlantic gave the aircraft points to navigate by. This flight was not eligible for the Daily Mail prize since it took more than 72 consecutive hours and also because more than one aircraft was used in the attempt. With the war over, there were four teams competing to be the first non-stop across the Atlantic. They were Australian pilot Harry Hawker with observer Kenneth Mackenzie-Grieve in a single engine Sopwith Atlantic; Frederick Raynham and C. W. F. Morgan in a Martinsyde; the Handley Page Group, led by Mark Kerr; and the Vickers entry John Alcock and Arthur Whitten Brown. Each group had to ship its aircraft to Newfoundland and make a rough field for the takeoff. Hawker and Mackenzie-Grieve made the first attempt on 18 May, but engine failure brought them down in the ocean where they were rescued. Raynham and Morgan also made an attempt on 18 May but crashed on take off due to the high fuel load. The Handley Page team was in the final stages of testing its aircraft for the flight in June, but the Vickers group was ready earlier. During 14–15 June 1919, the British aviators Alcock and Brown made the first non-stop transatlantic flight. During the War, Alcock resolved to fly the Atlantic, and after the war he approached the Vickers engineering and aviation firm at Weybridge, which had considered entering its Vickers Vimy IV twin-engined bomber in the competition but had not yet found a pilot. Alcock's enthusiasm impressed Vickers's team, and he was appointed as its pilot. Work began on converting the Vimy for the long flight, replacing its bomb racks with extra petrol tanks. Shortly afterwards Brown, who was unemployed, approached Vickers seeking a post and his knowledge of long distance navigation convinced them to take him on as Alcock's navigator. Alcock and Brown landed in Ireland in 1919. Vickers's team quickly assembled its plane and at around 1:45 p.m. on 14 June, while the Handley Page team was conducting yet another test, the Vickers plane took off from Lester's Field, in St. John's, Newfoundland. Alcock and Brown flew the modified Vickers Vimy, powered by two Rolls-Royce Eagle 360 hp engines. It was not an easy flight, with unexpected fog, and a snow storm almost causing the crewmen to crash into the sea. Their altitude varied between sea level and 12,000 feet (3,700 m) and upon takeoff, they carried 865 imperial gallons (3,900 L) of fuel. They made landfall in Galway at 8:40 a.m. on 15 June 1919, not far from their intended landing place, after less than sixteen hours of flying. The Secretary of State for Air, Winston Churchill, presented Alcock and Brown with the Daily Mail prize for the first crossing of the Atlantic Ocean in "less than 72 consecutive hours". There was a small amount of mail carried on the flight making it also the first transatlantic airmail flight. The two aviators were awarded the honour of Knight Commander of the Most Excellent Order of the British Empire (KBE) one week later by King George V at Windsor Castle. Charles Lindbergh with the Spirit of St. Louis – 1927. The first transatlantic flight by rigid airship, and the first return transatlantic flight, was made just a couple of weeks after the transatlantic flight of Alcock and Brown, on 2 July 1919. Major George Herbert Scott of the Royal Air Force flew the airship R34 with his crew and passengers from RAF East Fortune, Scotland to Mineola, New York (on Long Island), covering a distance of about 3,000 miles (4,800 km) in about four and a half days. The flight was intended as a testing ground for postwar commercial services by airship (see Imperial Airship Scheme), and it was the first flight to transport paying passengers. The R34 wasn't built as a passenger carrier, so extra accommodations was arranged by slinging hammocks in the keel walkway. The return journey to Pulham in Norfolk, was from 10 to 13 July over some 75 hours. The first transpolar flight eastbound and the first flight crossing the North Pole ever, was the airship carrying Norwegian explorer and pilot Roald Amundsen on 11 May 1926. He flew with the airship "NORGE" ("Norway") piloted by the Italian colonel Umberto Nobile, non-stop from Svalbard, Norway to Teller, Alaska, USA. The flight lasted for 72 hours. The first aerial crossing of the South Atlantic was made by the Portuguese naval aviators Gago Coutinho and Sacadura Cabral in 1922. Coutinho and Cabral flew from Lisbon, Portugal, to Rio de Janeiro, Brazil, using Fairey III biplanes, and they covered a distance of 8,383 kilometres (5,209 mi) between 30 March and 17 June. The first night-time crossing of the Atlantic was accomplished during 16–17 April 1927 by the Portuguese aviators Sarmento de Beires, Jorge de Castilho and Manuel Gouveia, flying from the Bijagós Archipelago, Portuguese Guinea, to Fernando de Noronha, Brazil in the Argos, a Dornier Wal flying boat. In the early morning of Friday, 20 May 1927, Charles Lindbergh took off from Roosevelt Field, Mineola, New York, on his successful attempt to fly nonstop from New York to the European continental land mass. Over the next 33.5 hours, Lindbergh and the Spirit of St. Louis encountered many challenges before landing at Le Bourget Airport near Paris, France, at 10:22 p.m. on Saturday, 21 May 1927, completing the first solo crossing of the Atlantic. The first east-west non-stop transatlantic crossing by an aeroplane was made in 1928 by the Bremen, a German Junkers W33 type aircraft, from Baldonnel Airfield in County Dublin, Ireland. On 18 August 1932 Jim Mollison made the first east-to-west solo trans-Atlantic flight; flying from Portmarnock in Ireland to Pennfield, New Brunswick, Canada in a de Havilland Puss Moth. The first transpolar transatlantic (and transcontinental) crossing was the non-stop flight piloted by Valery Chkalov covering some 8,811 kilometres (5,475 mi) over 63 hours from St. Petersburg, Russia to Vancouver, Washington from 18–20 June 1937. On 11 October 1928, Hugo Eckener, commanding the Graf Zeppelin airship as part of DELAG's operations, began the first non-stop transatlantic passenger flights, leaving Friedrichshafen, Germany, at 07:54 on 11 October 1928, and arriving at NAS Lakehurst, New Jersey, on 15 October. Thereafter, DELAG used the Graf Zeppelin on regular scheduled passenger flights across the North Atlantic, from Frankfurt-am-Main to Lakehurst. In the summer of 1931 a South Atlantic route was introduced, from Frankfurt and Friedrichshafen to Recife and Rio de Janeiro. Between 1931 and 1937 the Graf Zeppelin crossed the South Atlantic 136 times. DELAG introduced the Hindenburg, which began passenger flights in 1936 and made 36 Atlantic crossings (North and South). The first passenger trip across the North Atlantic left Friedrichshafen on 6 May with 56 crew and 50 passengers, arriving Lakehurst on 9 May. Fare was $400 one way; the ten westward trips that season took 53 to 78 hours and eastward took 43 to 61 hours. The last eastward trip of the year left Lakehurst on 10 October; the first North Atlantic trip of 1937 ended in the Hindenburg disaster. The British rigid airship R100 also made a successful return trip from Cardington to Montreal in July–August 1930, in what was intended to be a proving flight for regularly scheduled passenger services. Following the R101 disaster in October 1930, the British rigid airship program was abandoned and the R100 scrapped, leaving DELAG as the sole remaining operator of transatlantic passenger airship flights. Although Alcock and Brown first flew across the Atlantic in 1919, it took two more decades before commercial flights could become practical. The North Atlantic presented severe challenges for aviators due to weather and the long distances involved, with few stopping points. Initial transatlantic services, therefore, focused on the South Atlantic, where a number of French, German, and Italian airlines offered seaplane service for mail between South America and West Africa in the 1930s. From February 1934 to August 1939 Deutsche Lufthansa operated a regular airmail service between Natal, Brazil, and Bathurst, Gambia, continuing via the Canary Islands and Spain to Stuttgart, Germany. From December 1935, Air France opened a regular weekly airmail route between South America and Africa. German airlines, such as Deutsche Luft Hansa, experimented with mail routes over the North Atlantic in the early 1930s, with seaplanes and dirigibles. Foynes, Ireland was the European terminus for all transatlantic seaplane flights in the 1930s. In the 1930s, a seaplane route was the only practical means of transatlantic air travel, as land-based planes lacked sufficient flying range for the crossing. An agreement between the governments of the US, Britain, Canada, and the Irish Free State in 1935 set aside the Irish town of Foynes, the most westerly port in Ireland, as the terminal for all such services to be established. Imperial Airways had bought the Short Empire seaplane, primarily for use along the empire routes in Africa and Asia, but began to explore the possibility of using it for transatlantic flights from 1937. The range of the Short Empire was less than that of the equivalent US Sikorsky "Clipper" flying boats and as such was initially unable to provide a true trans-Atlantic service. Two boats (Caledonia and Cambria) were lightened and given long range tanks to increase the aircraft's range to 3,300 miles (5,300 km). Meanwhile, in the US, attention was initially focused on transatlantic flight for a faster postal service between Europe and America. In 1931 W. Irving Glover, the second assistant postmaster, wrote an article for Popular Mechanics on the challenges and the need for a regular service. In the 1930s, under the direction of Juan Trippe, Pan American World Airways began to get interested in the feasibility of a transatlantic passenger service using seaplanes. Captain Wilcockson signing an autograph for one of his admirers, in July 1937, near Montreal, Quebec. On 5 July 1937, A.S. Wilcockson flew a Short Empire for Imperial Airways from Foynes to Botwood, Newfoundland and Harold Gray piloted a Sikorsky S-42 for Pan American in the opposite direction. Both flights were a success and both airlines made a series of subsequent proving flights that same year to test out a variety of different weather conditions. Air France also became interested and began experimental flights in 1938. As the Short Empire only had enough range with enlarged fuel tanks at the expense of passenger room, a number of pioneering experiments were done with the aircraft to work around the problem. It was known that aircraft could maintain flight with a greater load than is possible to take off with, so Major Robert H. Mayo, Technical General Manager at Imperial Airways, proposed mounting a small, long-range seaplane on top of a larger carrier aircraft, using the combined power of both to bring the smaller aircraft to operational height, at which time the two aircraft would separate, the carrier aircraft returning to base while the other flew on to its destination. The Short Mayo Composite project, co-designed by Mayo and Shorts chief designer Arthur Gouge, comprised the Short S.21 Maia, (G-ADHK) which was a variant of the Short "C-Class" Empire flying-boat fitted with a trestle or pylon on the top of the fuselage to support the Short S.20 Mercury(G-ADHJ). The first successful in-flight separation of the Composite was carried out on 6 February 1938, and the first transatlantic flight was made on 21 July 1938 from Foynes to Boucherville. Mercury, piloted by Captain Don Bennett, separated from her carrier at 8 pm to continue what was to become the first commercial non-stop east-to-west transatlantic flight by a heavier-than-air machine. This initial journey took 20 hrs, 21 min at an average ground speed of 144 miles per hour (232 km/h). Another technology developed for the purpose of transatlantic commercial flight, was aerial refuelling. Sir Alan Cobham developed the Grappled-line looped-hose system to stimulate the possibility for long-range transoceanic commercial aircraft flights, and publicly demonstrated it for the first time in 1935. In the system the receiver aircraft trailed a steel cable which was then grappled by a line shot from the tanker. The line was then drawn back into the tanker where the receiver's cable was connected to the refueling hose. The receiver could then haul back in its cable bringing the hose to it. Once the hose was connected, the tanker climbed sufficiently above the receiver aircraft to allow the fuel to flow under gravity. Cobham founded Flight Refuelling Ltd in 1934 and by 1938 had demonstrated the FRL's looped-hose system to refuel the Short Empire flying boat Cambria from an Armstrong Whitworth AW.23. Handley Page Harrows were used in the 1939 trials to aerial refuel the Empire flying boats for regular transatlantic crossings. From 5 August – 1 October 1939, sixteen crossings of the Atlantic were made by Empire flying boats, with fifteen crossings using FRL's aerial refueling system. After the sixteen crossings further trials were suspended due to the outbreak of World War II. The Short S.26 was built in 1939 as an enlarged Short Empire, powered by four 1,400 hp (1,044 kW) Bristol Hercules sleeve valve radial engines and designed with the capability of crossing the Atlantic without refuelling. It was intended to form the backbone of Imperial Airways' Empire services. It could fly 6,000 miles (9,700 km) unburdened, or 150 passengers for a "short hop". On 21 July 1939, the first aircraft, (G-AFCI "Golden Hind"), was first flown at Rochester by Shorts' chief test pilot, John Lankester Parker. Although two aircraft were handed over to Imperial Airways for crew training, all three were impressed (along with their crews) into the RAF before they could start civilian operation with the onset of World War II. The Yankee Clipper in 1939. Meanwhile, Pan Am purchased nine Boeing 314 Clippers in 1939, a long-range flying boat capable of flying the Atlantic. The "Clippers" were built for "one-class" luxury air travel, a necessity given the long duration of transoceanic flights. The seats could be converted into 36 bunks for overnight accommodation; with a cruising speed of only 188 miles per hour (303 km/h). The 314s had a lounge and dining area, and the galleys were crewed by chefs from four-star hotels. Men and women were provided with separate dressing rooms, and white-coated stewards served five and six-course meals with gleaming silver service. The Yankee Clipper's inaugural trip across the Atlantic was on 24 June 1939. Its route was from Southampton to Port Washington, New York with intermediate stops at Foynes, Ireland, Botwood, Newfoundland, and Shediac, New Brunswick. Its first passenger flight was on 9 July, and this continued until the onset of the Second World War. The Clipper fleet was then pressed into military service and the flying boats were used for ferrying personnel and equipment to the European and Pacific fronts. In 1938 a Lufthansa Focke-Wulf Fw 200 Condor long range airliner flew non-stop from Berlin to New York and returned non-stop as a proving flight for the development of passenger carrying services. This was the first landplane to fulfil this function and marked a departure from the British and American reliance on seaplanes for long over-water routes. A regular Lufthansa Transatlantic service was planned but didn't start before World War II. RAF Darrell's Island during World War II. This base was used throughout the war for trans-Atlantic ferrying of aircraft. It was from the emergency exigencies of World War II that the crossing of the Atlantic by landplane became a practical and commonplace possibility. With the Fall of France in June 1940, and the loss of much war materiel on the continent, the need for the British to purchase replacement materiel from the United States was urgent. The aircraft – such as the Lockheed Hudson – purchased in the United States by Britain were flown to airports in Nova Scotia and Newfoundland, partially dis-assembled and loaded on ships and transported to England where they were unloaded and re-assembled, a process that could take several weeks, not counting repairing any damage to the aircraft incurred in the shipment. In addition, German U-boats operating in the North Atlantic Ocean were a constant menace to shipping routes in the North Atlantic making it very hazardous for merchant shipping between Newfoundland and Britain. However, larger aircraft could be flown directly to the UK and an organization was set up to manage this using civilian pilots. The program was begun by the Ministry of Aircraft Production. Its minister, Lord Beaverbrook a Canadian by origin, reached an agreement with Sir Edward Beatty, a friend and chairman of the Canadian Pacific Railway Company to provide ground facilities and support. Ministry of Aircraft Production would provide civilian crews and management and former RAF officer Don Bennett, a specialist in long distance flying and later Air Vice Marshal and commander of the Pathfinder Force, led the first delivery flight in November 1940. In 1941, MAP took the operation off CPR to put the whole operation under the Atlantic Ferry Organization ("Atfero") was set up by Morris W. Wilson, a banker in Montreal, Quebec. Wilson hired civilian pilots to fly the aircraft to the UK. 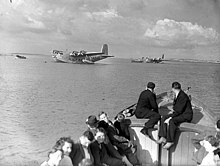 The pilots were then ferried back in converted RAF Liberators. "Atfero hired the pilots, planned the routes, selected the airports [and] set up weather and radiocommunication stations." Major trunk air routes of AAF Ferrying Command, June 1942. The organization was passed to Air Ministry administration though retaining civilian pilots, some of which were Americans, alongside RAF navigators and British radio operators. After completing delivery, crews were flown back to Canada for the next run. RAF Ferry Command was formed on 20 July 1941, by the raising of the RAF Atlantic Ferry Service to Command status. Its commander for its whole existence was Air Chief Marshal Sir Frederick Bowhill. As its name suggests, the main function of Ferry Command was the ferrying of new aircraft from factory to operational unit. Ferry Command did this over only one area of the world, rather than the more general routes that Transport Command later developed. The Command's operational area was the north Atlantic, and its responsibility was to bring the larger aircraft that had the range to do the trip over the ocean from American and Canadian factories to the RAF home Commands. With the entry of the United States into the War, the Atlantic Division of the United States Army Air Forces Air Transport Command began similar ferrying services to transport aircraft, supplies and passengers to the British Isles. By September 1944 British Overseas Airways Corporation (BOAC), as Imperial Airways had by then become, had made 1,000 transatlantic crossings. After World War II long runways were available, and North American and European carriers such as Pan Am, TWA, Trans Canada Airlines (TCA), BOAC, and Air France acquired larger piston airliners that could cross the North Atlantic with stops (usually in Gander, Newfoundland and/or Shannon, Ireland). In January 1946 Pan Am's DC-4 was scheduled New York (La Guardia) to London (Hurn) in 17 hours 40 minutes, five days a week; in June 1946 Lockheed L-049 Constellations had brought the eastward time to Heathrow down to 15 hr 15 min. To aid aircraft crossing the Atlantic, six nations grouped to divide the Atlantic into ten zones. Each zone had a letter and a vessels station in that zone, providing radio relay, radio navigation beacons, weather reports and rescues if an aircraft went down. The six nations of the group split the cost of these vessels. The September 1947 ABC Guide shows 27 passenger flights a week west across the North Atlantic to the US and Canada on BOAC and other European airlines and 151 flights every two weeks on Pan Am, AOA, TWA and TCA, 15 flights a week to the Caribbean and South America, plus three a month on Iberia and a Latécoère 631 six-engine flying boat every two weeks to Fort de France. In May 1952 BOAC was the first airline to introduce a passenger jet, the de Havilland Comet, into airline service. All Comet 1 aircraft were grounded in April 1954 after four Comets crashed, the last two being BOAC aircraft at altitude. Later jet airliners including the larger and longer-range Comet 4 were designed to be fail-safe: in the event of for example a skin-failure due to cracking the damage would be localized and not catastrophic. On 4 October 1958, BOAC started transatlantic flights between London Heathrow and New York Idlewild with a Comet 4, and Pan Am followed on 26 October with a Boeing 707 service between New York and Paris. Supersonic flights on the Concorde were offered from 1976 to 2003, from London (by British Airways) and Paris (by Air France) to New York and Washington, and back, with flight times of around three and a half hours one-way. Since the loosening of regulations in the 1970s and 1980s, many airlines now compete across the Atlantic. In 2015, 44 million seats were offered on the transatlantic routes, an increase of 6% over the previous year. Of the 67 European airports with links to North America, the busiest was London Heathrow Airport with 231,532 weekly seats, followed by Paris Charles de Gaulle Airport with 129,831, Frankfurt Airport with 115,420, and Amsterdam Airport Schiphol with 79,611. Of the 45 airports in North America, the busiest linked to Europe was New York John F. Kennedy International Airport with 198,442 seats, followed by Toronto Pearson International Airport with 90,982, New York Newark Liberty International Airport with 79,107, and Chicago O'Hare International Airport with 75,391 seats. Joint ventures, allowing coordination on prices, schedules, and strategy, control almost 75% of Transatlantic capacity. They are parallel to airline alliances: British Airways, Iberia and American Airlines are part of Oneworld; Lufthansa, Air Canada and United Airlines are members of Star Alliance; and Delta Air Lines, Air France, KLM and Alitalia belong to SkyTeam. Low cost carriers are starting to compete on this market, most importantly Norwegian Air Shuttle, WestJet and WOW Air. A total of 431 non-stop routes between North America and Europe were scheduled for summer 2017, up 84 routes from 347 in 2012 – a 24% increase. In 2016 Dr. Paul Williams of the University of Reading published a scientific study showing that transatlantic flight times are expected to change as the North Atlantic jet stream responds to global warming, with eastbound flights speeding up and westbound flights slowing down. In February 2017, Norwegian Air International announced it would start transatlantic flights to the United States from the United Kingdom and Ireland in summer 2017 on behalf of its parent company using the parent's new Boeing 737 MAX aircraft expected to be delivered from May 2017. Norwegian Air performed its first transatlantic flight with a Boeing 737-800 on 16 June 2017 between Edinburgh Airport and Stewart Airport, New York. The first transatlantic flight with a 737 MAX was performed on 15 July 2017, with a MAX 8 named Sir Freddie Laker, between Edinburgh Airport in Scotland and Hartford International Airport in the US state of Connecticut, followed by a second rotation from Edinburgh to Stewart Airport, New York. Long-Haul low-cost carriers are emerging on the transatlantic market with 545,000 seats offered over 60 city pairs in September 2017 (a 66% growth over one year), compared to 652,000 seats over 96 pairs for Leisure airlines and 8,798,000 seats over 357 pairs for mainline carriers. LCC seat grew to 7.7% of North Atlantic seats in 2018 from 3.0% in 2016, led by Norwegian with 4.8% then WOW air with 1.6% and WestJet with 0.6%, while the three airline alliances dedicated joint ventures seat share is 72.3%, down from 79.8% in 2015. By July 2018, Norwegian became the largest European airline for New York, carrying 1.67 million passengers over a year, beating British Airways’s 1.63 million, while the U.S. major carriers combined transported 26.1 million transatlantic passengers. Unlike over land, transatlantic flights use standardized aircraft routes called North Atlantic Tracks (NATs). These change daily in position (although altitudes are standardized) to compensate for weather—particularly the jet stream tailwinds and headwinds, which may be substantial at cruising altitudes and have a strong influence on trip duration and fuel economy. Eastbound flights generally operate during night-time hours, while westbound flights generally operate during daytime hours, for passenger convenience. The eastbound flow, as it is called, generally makes European landfall from about 0600UT to 0900UT. The westbound flow generally operates within a 1200–1500UT time-slot. Restrictions on how far a given aircraft may be from an airport also play a part in determining its route; in the past, airliners with three or more engines were not restricted, but a twin-engine airliner was required to stay within a certain distance of airports that could accommodate it (since a single engine failure in a four-engine aircraft is less crippling than a single engine failure in a twin). Modern aircraft with two engines flying transatlantic (the most common models used for transatlantic service being the Airbus A330, Boeing 767 and Boeing 777) have to be ETOPS certified. Gaps in air traffic control and radar coverage over large stretches of the Earth's oceans, as well as an absence of most types of radio navigation aids, impose a requirement for a high level of autonomy in navigation upon transatlantic flights. Aircraft must include reliable systems that can determine the aircraft's course and position with great accuracy over long distances. In addition to the traditional compass, inertials and satellite navigation systems such as GPS all have their place in transatlantic navigation. Land-based systems such as VOR and DME, because they operate "line of sight", are mostly useless for ocean crossings, except in initial and final legs within about 240 nautical miles (440 km) of those facilities. In the late 1950s and early 1960s an important facility for low-flying aircraft was the Radio Range. Inertial navigation systems became prominent in the 1970s. In October 1910, the American journalist Walter Wellman, who had in 1909 attempted to reach the North Pole by balloon, set out for Europe from Atlantic City in a dirigible, America. A storm off Cape Cod sent him off course, and then engine failure forced him to ditch halfway between New York and Bermuda. Wellman, his crew of five – and the balloon's cat – were rescued by RMS Trent, a passing British ship. The Atlantic bid failed, but the distance covered, about 1,000 statute miles (1,600 km), was at the time a record for a dirigible. On 8–31 May 1919, the U.S. Navy Curtiss NC-4 flying boat under the command of Albert Read, flew 4,526 statute miles (7,284 km) from Rockaway, New York, to Plymouth (England), via among other stops Trepassey (Newfoundland), Horta and Ponta Delgada (both Azores) and Lisbon (Portugal) in 53h 58m, spread over 23 days. The crossing from Newfoundland to the European mainland had taken 10 days 22 hours, with the total time in flight of 26h 46m. The longest non-stop leg of the journey, from Trepassey, Newfoundland, to Horta in the Azores, was 1,200 statute miles (1,900 km) and lasted 15h 18m. On 18 May 1919, the Australian Harry Hawker, together with navigator Kenneth Mackenzie Grieve, attempted to become the first to achieve a non-stop flight across the Atlantic Ocean. They set off from Mount Pearl, Newfoundland, in the Sopwith Atlantic biplane. After fourteen and a half hours of flight the engine overheated and they were forced to divert towards the shipping lanes: they found a passing freighter, the Danish Mary, established contact and crash-landed ahead of her. Mary's radio was out of order, so that it was not until six days later when the boat reached Scotland that word was received that they were safe. The wheels from the undercarriage, jettisoned soon after takeoff, were later recovered by local fishermen and are now in the Newfoundland Museum in St. John's. Alcock and Brown's Vickers Vimy takes off from Newfoundland. On 14–15 June 1919, Capt. John Alcock and Lieut. Arthur Whitten Brown of the United Kingdom in Vickers Vimy bomber, between islands, 1,960 nautical miles (3,630 km), from St. John's, Newfoundland, to Clifden, Ireland, in 16h 12m. On 2 July 1919, Major George Herbert Scott of the Royal Air Force with his crew and passengers flies from RAF East Fortune, Scotland to Mineola, New York (on Long Island) in airship R34, covering a distance of about 3,000 statute miles (4,800 km) in about four and a half days. R34 then made the return trip to England arriving at RNAS Pulham in 75 hours, thus also completing the first double crossing of the Atlantic (east-west-east). On 30 March–17 June 1922, Lieutenant Commander Sacadura Cabral and Commander Gago Coutinho of Portugal, using three Fairey IIID floatplanes (Lusitania, Portugal, and Santa Cruz), after two ditchings, with only internal means of navigation (the Coutinho-invented sextant with artificial horizon) from Lisbon, Portugal, to Rio de Janeiro, Brazil. In October 1924, the Zeppelin ZR-3 (LZ-126), flew from Germany to New Jersey with a crew commanded by Dr. Hugo Eckener, covering a distance of about 4,000 statute miles (6,400 km). On the night of 16–17 April 1927, the Portuguese aviators Sarmento de Beires, Jorge de Castilho and Manuel Gouveia, flew from the Bijagós islands, Portuguese Guinea to Fernando de Noronha island, Brazil in the Dornier Wal flying boat Argos. On 28 April 1927, Brazilian João Ribeiro de Barros, with the assistance of João Negrão (co-pilot), Newton Braga (navigator), and Vasco Cinquini (mechanic), crossed the Atlantic in the hydroplane Jahú. The four aviators flew from Genoa, in Italy, to Santo Amaro (São Paulo), making stops in Spain, Gibraltar, Cape Verde and Fernando de Noronha, in the Brazilian territory. On 8–9 May 1927, Charles Nungesser and François Coli attempted to cross the Atlantic from Paris to the USA in a Levasseur PL-8 biplane L'Oiseau Blanc ("The White Bird"), but were lost. On 20–21 May 1927, Charles A. Lindbergh flew his Ryan monoplane (named Spirit of St. Louis), 3,600 nautical miles (6,700 km), from Roosevelt Field, New York to Paris–Le Bourget Airport, in 33½ hours. On 4–6 June 1927, the first transatlantic air passenger was Charles A. Levine. He was carried as a passenger by Clarence D. Chamberlin from Roosevelt Field, New York, to Eisleben, Germany, in a Wright-powered Bellanca. On 14–15 October 1927, Dieudonne Costes and Joseph le Brix, flying a Breguet 19, flew from Senegal to Brazil. On 12–13 April 1928, Ehrenfried Günther von Hünefeld and Capt. Hermann Köhl of Germany and Comdr. James Fitzmaurice of Ireland, flew a Junkers W33 monoplane (named Bremen), 2,070 statute miles (3,330 km), from Baldonnell near Dublin, Ireland, to Labrador, in 36½ hours. On 17–18 June 1928, Amelia Earhart was a passenger on an aircraft piloted by Wilmer Stultz. Since most of the flight was on instruments for which Earhart had no training, she did not pilot the aircraft. Interviewed after landing, she said, "Stultz did all the flying — had to. I was just baggage, like a sack of potatoes. Maybe someday I'll try it alone." On 1–8 August 1929, in making the circumnavigation, Dr Hugo Eckener piloted the LZ 127 Graf Zeppelin across the Atlantic three times: from Germany 4,391 statute miles (7,067 km) east to west in four days from 1 August; return 4,391 statute miles (7,067 km) west to east in two days from 8 August; after completing the circumnavigation to Lakehurst, a final 4,391 statute miles (7,067 km) west to east landing 4 September, making three crossings in 34 days. From 1931 onwards, LZ 127 Graf Zeppelin operated the world's first scheduled transatlantic passenger flights, mainly between Germany and Brazil (64 such round trips overall) sometimes stopping in Spain, Miami, London, and Berlin. On 1–2 September 1930, Dieudonne Costes and Maurice Bellonte flew a Breguet 19 Super Bidon biplane (named Point d'Interrogation, Question Mark), 6,200 km from Paris to New York City. On 23 June–1 July 1931, Wiley Post and Harold Gatty in a Lockheed Vega monoplane (named Winnie Mae), 15,477 nm (28,663 km) flew from Long Island in 8d 15h 51m, with 14 stops, with a total flying time 107h 2m. On 28–30 July 1931, Russell Norton Boardman and John Louis Polando flew a Bellanca Special J-300 high-wing monoplane named the Cape Cod from New York City's Floyd Bennett Field to Istanbul in 49:20 hours in completely crossing the North Atlantic and much of the Mediterranean Sea; establishing a straight-line distance record of 5,011.8 miles (8,065.7 km). 27–28 November 1931. Bert Hinkler flew from Canada to New York, then via the West Indies, Venezuela, Guiana, Brazil and the South Atlantic to Great Britain in a de Havilland Puss Moth. On 20 May 1932, Amelia Earhart set off from Harbour Grace, Newfoundland, intending to fly to Paris in her single engine Lockheed Vega 5b to emulate Charles Lindbergh's solo flight. After encountering storms and a burnt exhaust pipe, Earhart landed in a pasture at Culmore, north of Derry, Northern Ireland, ending a flight lasting 14h 56m. On 18–19 August 1932, Jim Mollison, flying a de Havilland Puss Moth, flew from Dublin to New Brunswick. On 7–8 May 1933, Stanisław Skarżyński made a solo flight across the South Atlantic, covering 3,582 kilometres (2,226 mi), in a RWD-5bis – empty weight below 450 kilograms (990 lb). If considering the total takeoff weight (as per FAI records) then there is a longer distance Atlantic crossing: the distance world record holder, Piper PA-24 Comanche in this class, 1000–1750 kg. |FAI[permanent dead link]. Notable mass transatlantic flight: On 1–15 July 1933, Gen. Italo Balbo of Italy led 24 Savoia-Marchetti S.55X seaplanes 6,100 statute miles (9,800 km), in a flight from Orbetello, Italy, to the Century of Progress International Exposition Chicago, Illinois, in 47h 52m. The flight made six intermediate stops. Previously, Balbo had led a flight of 12 flying boats from Rome to Rio de Janeiro, Brazil, in December 1930 – January 1931, taking nearly a month. On 15–22 July 1933, Wiley Post flew Lockheed Vega monoplane Winnie Mae 15,596 statute miles (25,099 km) in 7d 8h 49m, with 11 stops; flying time, 115h 36 mi. On 4–5 September 1936, Beryl Markham, flying a Percival Vega Gull from Abingdon, England intended to fly to New York, but was forced down at Cape Breton Island, Nova Scotia, due to icing of fuel tank vents. on 24 June 1939, Pan American inaugurated transatlantic passenger service between New York and Marseilles, France, using Boeing 314 flying boats. On 8 July 1939, a service began between New York and Southampton as well. A single fare was US$375. Scheduled landplane flights started in October 1945. On 1 June 1944, two K class blimps from Blimp Squadron 14 of the United States Navy (USN) completed the first transatlantic crossing by non-rigid airships. On 28 May 1944, the two K-ships (K-123 and K-130) left South Weymouth, Massachusetts, and flew approximately 16 hours to Naval Station Argentia, Newfoundland. From Argentia, the blimps flew approximately 22 hours to Lajes Field on Terceira Island in the Azores. The final leg of the first transatlantic crossing was about a 20-hour flight from the Azores to Craw Field in Port Lyautey (Kenitra), French Morocco. On 14 July 1948, six de Havilland Vampire F3s of No. 54 Squadron RAF, commanded by Wing Commander D S Wilson-MacDonald, DSO, DFC, flew via Stornoway, Iceland, and Labrador to Montreal on the first leg of a goodwill tour of the U.S. and Canada. In 1949, the Lucky Lady II, a Boeing B-50 Superfortress of the U. S. Air Force, commanded by Captain James Gallagher, became the first aeroplane to circle the world nonstop. This was achieved by refueling the plane in flight. Total time airborne was 94 hours and 1 minute. On 21 February 1951, an RAF English Electric Canberra B Mk 2 (serial number WD932) flown by Squadron Leader A Callard of the A&AEE, flew from Aldergrove Northern Ireland, to Gander, Newfoundland. The flight covered almost 1,800 nautical miles (3,300 km) in 4h 37 m. The aircraft was being flown to the U.S. to act as a pattern aircraft for the Martin B-57 Canberra. On 4 October 1958, British Overseas Airways Corporation (BOAC) flew the first jet airliner service using the de Havilland Comet, when G-APDC initiated the first transatlantic Comet 4 service and the first scheduled transatlantic passenger jet service in history, flying from London to New York with a stopover at Gander. On 21, January 1976 Concorde jet makes first commercial flight. Supersonic flights were available until 2003. In 2005, Steve Fossett, flying a Virgin Atlantic GlobalFlyer, set the current record for fastest aerial circumnavigation (first non-stop, non-refueled solo circumnavigation in an airplane) in 67 hours, covering 37,000 kilometers. 29 June–1 July 1927: Admiral Richard Byrd with crew flew Fokker F.VIIa/3m America from New York City to France. 13 July 1928: Ludwik Idzikowski and Kazimierz Kubala attempt a crossing of the Atlantic westbound from Paris to the USA in an Amiot 123 biplane, but crash in the Azores. 6–9 February 1933. Jim Mollison flew a Puss Moth from Senegal to Brazil, across South Atlantic, becoming the first person to fly solo across the North and South Atlantics. 15–17 July 1933: Lithuanians Steponas Darius and Stasys Girėnas were supposed to make a non-stop flight from New York City via Newfoundland to Kaunas in their aircraft named Lituanica, but crashed in the forests of Germany after 6,411 km of flying, only 650 km short of their final destination after a flying time 37 hours, 11 minutes. They carried the first transatlantic airmail consignment. 10 December 1936: Portuguese-American aviator Joseph Costa took off from the Elmira-Corning Regional Airport in a Lockheed Vega named "Crystal City", attempting to cross the Atlantic and land in Portugal, via Brazil. His plane crashed just before a stopover in Rio de Janeiro, on 15 January 1937. 5 July 1937: Captain Harold Gray of Pan Am flew from Botwood, Newfoundland to Foynes, Ireland, in a Sikorsky S-42 flying boat as part of the first transatlantic commercial passenger test flights. 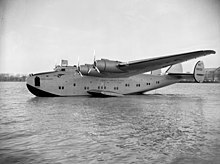 On 6 July 1937, Captain Arthur Wilcockson of Imperial Airways flew from Foynes to Botwood, in a Short Empire class flying boat named Caledonia. 21 July 1938: The Short Mercury flew from Foynes, on the west coast of Ireland, to Boucherville, Montreal, Quebec, Canada, a flight of 2,930 statute miles (4,720 km). The Short Maia, flown by Captain A.S. Wilcockson, took off carrying Mercury (piloted by Captain, later Air Vice Marshal Don Bennett). [N 1]Mercury separated from the carrier aircraft to continue what was to become the first commercial non-stop east-to-west transatlantic flight by a heavier-than-air machine. This initial journey took 20 hrs 21 min at an average ground speed of 144 mph (232 km/h). 10 August 1938: The first non-stop flight from Berlin to New York was with a Focke-Wulf Fw 200 that flew Staaken to Floyd Bennett in 24 hours, 56 minutes and did the return flight three days later in 19 hours, 47 minutes. 2 May 2002: Lindbergh's grandson, Erik Lindbergh, celebrated the 75th anniversary of the pioneering 1927 flight of the Spirit of St. Louis by duplicating the journey in a single engine, two seat Lancair Columbia 200. 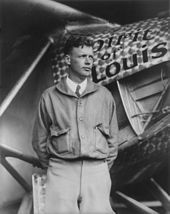 The younger Lindbergh's solo flight from Republic Airport on Long Island, to Le Bourget Airport in Paris was completed in 17 hours and 7 minutes, or just a little more than half the time of his grandfather's 33.5 hour original flight. 22–23 September 2011: Mike Blyth and Jean d'Assonville flew a Sling 4 prototype Light Sport Aircraft, registration ZU-TAF, non-stop from Cabo Frio International Airport, Brazil to Cape Town International Airport, South Africa, a distance of 6,222 km, in 27 hours. The crew set course for co-ordinates 34°S 31°W to take advantage of the westerly winds and at the turning point proceeded in an easterly direction, roughly following the 35°S parallel. This took them within 140 km north of the most remote inhabited island in the world, Tristan da Cunha. The Cabo Frio/Cape Town leg was part of an around the world flight. In September 2013, Jonathan Trappe lifted off from Caribou, Maine, United States in an attempt to make the first crossing of the Atlantic Ocean by cluster balloon. The craft is essentially a small yellow lifeboat attached to 370 balloons filled with helium. A short time later, due to difficulty controlling the balloons, Trappe was forced to land near the town of York Harbour, Newfoundland and Labrador, Canada. Trappe had expected to arrive in Europe sometime between three and six days after liftoff. The craft ascended by the dropping of ballast, and was to drift at an altitude of up to 25,000 ft (7.6 km). It was intended to follow wind currents toward Europe, the intended destination, however, unpredictable wind currents could have forced the craft to North Africa or Norway. To descend, Trappe would have popped or released some of the balloons. The last time the Atlantic was crossed by helium balloon was in 1984 by Colonel Joe Kittinger. ^ Captain Bennett was later the first commander of the RAF Pathfinder Force in World War II. ^ Nevin, David. "Two Daring Flyers Beat the Atlantic before Lindbergh." Journal of Contemporary History 28: (1) 1993, 105. ^ a b "₤10,000 for first transatlantic flight (in 72 consecutive hours)". Flight magazine. 21 November 1918. p. 1316. Retrieved 5 January 2009. ^ "Daily Mail £10,000 prize conditions 1918". ^ a b "Aviation: The Pioneer Period". ^ a b Benjamin J. Burns. The Flying Firsts of Walter Hinton. ^ "Alcock and Brown – Great Britain". Aviation-history.com. Retrieved: 23 September 2011. ^ a b Anon. "The Atlantic Challenge:Alcock and Brown Take the Atlantic". Century of Flight. Centuryofflight.net. Retrieved 16 June 2012. ^ "Alcock and Brown". Aviation History Online Museum. ^ "₤10,000 for first transatlantic flight (in 72 continuous hours)". Flight magazine. 5 April 1913. p. 393. Retrieved 5 January 2009. ^ Anon. "AFTER THE FLIGHT". Long flight. Science Museum. Archived from the original on 29 September 2012. Retrieved 15 June 2012. ^ "The Flight of the Bremen". Republished 50 years on, retrieved from The Irish Times, 12 April 1978. ^ "Mollison's Atlantic Flight." Flight, 26 August 1932, p. 795. ^ "Graf Zeppelin history". Airships.net. Retrieved: 5 July 2013. ^ Graue, James W. and John Duggan. Deutsche Lufthansa South Atlantic Airmail Service 1934–1939. Meersburg, Germany: Zeppelin Study Group, 2000. ISBN 0-9514114-5-4. ^ a b c "The Flying Boats of Foynes". History Ireland. ^ "Wings Across The Atlantic." Popular Mechanics, March 1931. ^ Gandt, Robert L. China Clipper—The Age of the Great Flying Boats. Annapolis, Maryland: Naval Institute Press, 1991. ISBN 0-87021-209-5. ^ Barnes C.H. Shorts Aircraft since 1900. London (1989): Putnam. p. 560. ISBN 0-85177-819-4. ^ Follett, Ken (1991). "Author's Note". Night over water. New York: William Morrow and Company. p. 399. ISBN 0-688-04660-6. LCCN 91017701. ^ "British Airways Concorde." Travel Scholar, Sound Message, LLC. Retrieved: 19 August 2006. ^ "Air Traffic Fills Atlantic Skies." Popular Mechanics, December 1953, pp. 94–95. ^ Max Kingsley Jones (4 Oct 2018). "How the jet travel era began in earnest – 60 years ago". Flightglobal. ^ a b "The transatlantic market" (PDF). Anna.aero. 4 June 2015. ^ "ANALYSIS: The Transatlantic Market in Summer 2016". Airways News. 5 May 2016. Archived from the original on 6 May 2016. ^ "Over 80 new routes between North America and Europe launched since S12; North America to Asia routes up by 50% in same period". Anna.aero. 25 Jan 2017. ^ Williams, Paul D. "Transatlantic flight times and climate change" Environmental Research Letters, 11(2), 024008, 2016. doi:10.1088/1748-9326/11/2/024008. ^ "Norwegian unveils £69 flights to the USA from 5 UK and Irish cities" (Press release). Norwegian Air. 23 February 2017. ^ "New era budget travel Norwegian begins Boeing 737 flights Europe". USA Today. 16 June 2017. ^ Victoria Moores (18 July 2017). "Norwegian performs first transatlantic 737 MAX flight". Aviation Week Network. ^ "LCCs – in it for the long-haul?". Flightglobal. 5 Oct 2017. ^ "North Atlantic aviation market: LCCs grow market share". CAPA. 12 Apr 2018. ^ Cathy Buyck (9 October 2018). "Norwegian Now Non-U.S. Leader in Transatlantic NYC Market". AIN online. ^ "747-400 fleet profile: Air France, Cathay Pacific and Saudia retire passenger 747 fleets in 2016". CAPA – Centre for Aviation. 18 January 2016. ^ The Times, 18 October 1910, p. 6; The New York Times, 18 October 1910, p. 1; Daily News (London), 19 October 1910, p. 1. ^ "1Coutinho and Cabral 1922 Summary." Honeymooney.com. Retrieved: 23 September 2011. ^ Althoff, William F. USS Los Angeles: The Navy's venerable Airship and Aviation Technology. Dulles, Virginia: Brassey's Inc., 2003. ISBN 1-57488-620-7. ^ Wagner, Wolfgang. Hugo Junkers: Pionier der Luftfahrt (Die deutsche: German). Bonn: Luftfahrt Bernard & Graefe Verlag, 1996. ISBN 3-7637-6112-8. ^ "Round the World Flights." Wingnet.org. Retrieved: 23 September 2011. ^ "'Cape Cod's' Success Climaxes 5 Years [of] Bellanca Records". The Sunday Morning Star, Wilmington, DE. 2 August 1931. Retrieved 4 September 2013. ^ "Airisms from the Four Winds - More Atlantic Flights". Flight. United Kingdom: flightglobal.com. 31 July 1931. p. 774. Retrieved 23 February 2016. ^ Wixted, E.P. "Hinkler, Herbert John Louis (Bert) (1892–1933)." Australian Dictionary of Biography, 2013, first published in hardcopy in Australian Dictionary of Biography, Volume 9, (MUP), 1983. ^ "Blimp Squadron 14." Warwingsart.com. Retrieved: 23 September 2011. ^ Kaiser, Don. "K-Ships Across the Atlantic." Naval Aviation News, Vol. 93(2), 2011. Retrieved: 23 September 2011. ^ Kline, R. C. and S. J. Kubarych. Blimpron 14 Overseas. Washington, D.C.: Naval Historical Center, Navy Yard, 1944. ^ "Records". Archived 7 October 2007 at the Wayback Machine Official FAI database. Retrieved: 5 September 2007. ^ "Also contains an eye-witness account of the first in-flight separation." Archived 18 November 2008 at the Wayback Machine Borstal.org.uk. Retrieved: 23 September 2011. ^ Silverman, Steven M. "Another Lucky Lindy Lands in Paris." People, 3 May 2002. Retrieved: 22 January 2011. ^ "Welcome to The Airplane Factory in Johannesburg, South Africa." Archived 25 September 2011 at the Wayback Machine Airplanefactory.co.za. Retrieved: 23 September 2011. ^ "Hundreds of helium-filled balloons being used in attempt to cross Atlantic Ocean." The Washington Post, 13 August 2013. Retrieved: 13 September 2013. ^ a b "World news: Helium balloons lift aviator Jonathan Trappe Up for transatlantic trip." The Guardian. Retrieved: 13 September 2013. ^ " Latest: American sets off for Europe in rainbow balloon." New Straits Times. Retrieved: 13 September 2013. ^ "Man Using Cluster Balloons Lands in Newfoundland: York Harbour, Newfoundland." ABC News, 13 September 2013. Retrieved: 23 September 2013. ^ Waldron, Ben. "Balloonist Attempts Record Flight Across the Atlantic." ABC News. Retrieved: 13 September 2013. North Atlantic Skies. NATS. 26 June 2014. Every day, between two and three thousand aircraft fly across the North Atlantic between Canada, the United States and Europe. This visualization shows Transatlantic traffic over a 24 hour period taken from a day in August last year and shows 2,524 flights crossing the North Atlantic.